05.08.14 – Mature. Refined. Sweet, but not too sweet. Meet the dessert that was made for mom, but perfect for any occasion, here. 05.05.14 – It doesn’t have to be Cinco de Mayo for us to appreciate a great taco. Try this twist – a jicama shell! – here. "It was perfect!! We thought about cart racing, but really enjoy the cooking aspect of bonding. It forces people to work together as a team but yet learn a little more about each other and not talk shop. 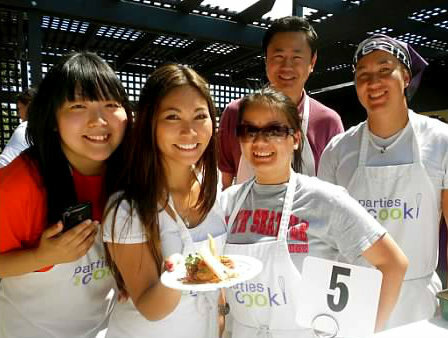 I've used Parties That Cook for 3 or 4 times now and never had an unpleasant event!!" "Whirlyball (ugh), bowling party (no thank you), fancy dinner out (runner-up). Cooking was not stressful, but fun and achievable. Loved the family-style sit-down meal after cooking. I will definitely recommend you, and already have since last night." "We wanted more than just a dinner. An activity that was fun, yet team building at the same time. Both were accomplished." Take Your Team Building Outdoors! Tell us your date, select from our preferred outdoor venues, and we’ll plan an unforgettable cooking event for your team today. You could say we've put this recipe through the ringer. We tested it at recipe testing for our spring menus. Then, we tweaked it for Cookbook Club. Finally, we perfected it for our spring corporate events. And now we’re giving it to you! We’re sure you’ll enjoy this sweet yet tart treat as much as I've enjoyed every step of the taste-testing process. Looking for a light and refreshing recipe to sustain you through the spring season? Our Founder & CEO, Bibby Gignilliat, shares her Little Fish Tacos with Cucumber Salad and Chipotle-Lime Aioli recipe, complete with helpful tips for customizing the meal to your taste. Find your new favorite weeknight recipe here. It's Wedding Season. 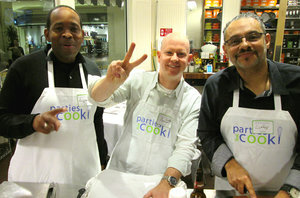 Couples cooking classes are the perfect way to spice up "Date Night", and also make great engagement and wedding gifts! Give your friends, family, and colleagues a cooking class gift certificate for 2 they can redeem anytime throughout the year.